Will Francis Collins be able to reconcile the opposing views on human embryonic stem cell (hES) research held by the pro-life supporters, and the pro-science advocates in the US? 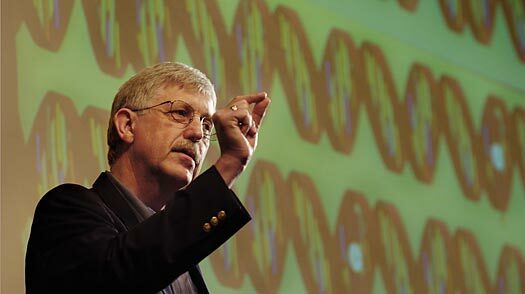 Francis Collins was appointed NIH Director by President Obama in July 2009. On the one hand, his appointment was neither unanimously nor warmly welcomed by scientists, who regarded him of being “too Christian” on the basis of his openly held faith, and of his books titled “The language of God” and “The language of life”. On the other hand, the pro-life supporters considered him to be too “pro-science”, buttressing their convictions with the fact that Collins has always been a hard-core scientist (first a physician, and then a geneticist), besides being former Director of the International Genome Sequencing Consortium, and co-announcer of the completion of the Human Genome Project with Craig Venter in 2000. In his first months as NIH Director, Collins has been blessed by what we may call a sort of “presidency honeymoon” like-period. Just a few months before, in April 2009, President Obama had signed the NIH Recovery Act, which opened up new funds new funds for biomedical research, finally giving a breath to the scientists, who had been in dire straits under the Bush administration. In December 2009, Collins announced that the first new hES cell lines had been approved, and by the end of July 2010 the total number of hES cell lines approved for federal research had reached seventy-five. The first trial of an hES therapy had also been approved by FDA this summer: the cells, developed by the Geron Corporation and the University of California at Irvine, would be injected into the injury sites of spinal-cord patients, with the aim of shifting “the outcome of the complete spinal-cord injured patient from one of no hope for any recovery to an outcome much like the incomplete patients who can respond to physical therapy”, as put by Geron Corp. CEO Thomas Okarma. Francis Collins’ honeymoon period as NIH president, though, was abruptly put to a halt on August 23, 2010, when judge Royce C. Lamberth of the federal district of D.C., prohibited issuing NIH funds to research on hES, on the basis of an amendment called Dickey-Wicker (from the names of its coauthors) that had been signed by Congress in 1996, and since that every year. Lamberth’s sentence reversed the decision taken by President Obama in March 2009 to uplift the veto on hES research that had been in force since Bush’s administration in 2001. As reported by Peter Boyer in his article “The covenant” published in the New Yorker, Lamberth’s decision has had dramatic and immediate effects: “Researchers who had already received funding could continue their work, but would not be able to apply for renewed funding. Fifty promising projects that were up for peer review were pulled. Another dozen projects, which had scored highly in peer reviews and were awaiting final approval, were suspended. Twenty-two grants that were coming up for annual renewal in September were frozen”. (http://www.newyorker.com/reporting/2010/09/06/100906fa_fact_boyer). On September 9, 2010, the Court of Appeal of Washington DC has temporarily suspended Lamberth’s decision, and has given both parties until September 20th to come up with new arguments for the case in point. The story, therefore, is not over. A tough reconciliation task awaits Mr Collins. As portrayed in the cartoon which accompanies Boyer’s article in the NewYorker, the NIH Director looks torn like Jesus on the cross by two sides: science and religion. Will he able to reconciliate the two, when so many have failed before him? Two possible scenarios await Mr Collins. The former fits one commonly held narrative, according to which the panacea to conflicts between science and religion is to be found in scientific solutions that fit the ethical dilemmas: for example, the creation, with altered nuclear transfer (ANT), of human embryos which are not able to develop into a foetus, as they lack a fundamental protein involved in the development of the placenta. If this were the road chosen by Collins, it would mean that research on induced pluripotent stem cells would be heavily funded (A/N, iPS are adult skin cells that can be reprogrammed to an embryonic-like state). But, as Stephen Minger and Herbert Gottweis have pointed out in their article aptly titled “iPS and the politics of promise”, the perspective of iPS cells as a “magic sword cutting through the Gordian knot of human stem cell science is deeply flawed and succumbs to a dangerous politics of promise that has more to do with wishful thinking than the realities of human stem cell research”. (Nature Biotechnology 2008, doi:10.1038/nbt0308-271) According to this line of reasoning, towards which I am sympathetic, answers to political and ethical questions as this are not to be found in science alone, but in a more complex and subtle interplay between the above mentioned disciplines, taking into account also the societal and legal context in which they arise. Collins has been reported saying (see above mentioned NewYorker article) that it would be foolish to adopt an either/or policy, while we should instead try and pursue a both/and policy. It is quite obvious how such a both/and policy would look definitely more an uphill trail to take. Notwithstanding, we wish Mr Collins will decide to hike this one, and that it would not be the case that such a tough climb will tear him apart, as the picture that represents him on the NewYorker comic seem to indicate (http://www.newyorker.com/reporting/2010/09/06/100906fa_fact_boyer) . This entry was posted in Bioethics, Health Policy and Sociology and tagged Collins, FDA, hES, Lamberth, NIH by . Bookmark the permalink.